Located next to the Church of St. Vitus which was built in the 14th century with views of Cesky Krumlov Castle, this delightful twenty-two room, four-star hotel in the historical heart of Cesky Krumlov offers access to all the wonderment of this story-book like destination, including the Museum Fotoatelier Seidel. 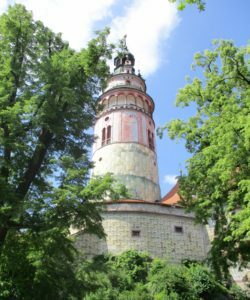 The Castle, governed by the Von Rosenberg family for centuries, is home to forty Renaissance buildings standing on medieval streets overlooking the Vitava River and was designated a UNESCO Heritage site in 1992. The hotel has a rooftop terrace, an amazing river & castle view from the outdoor restaurant. The Cafe and petit bar at the entrance of the hotel provide a twenty-four hour desk clerk who assists guests with dry cleaning, laundry, luggage storage and security of valuables. The lobby bar offers coffee and tea, free newspapers and a computer station for guest use. Rooms vary from standard double to single, family suites, and deluxe double suites. A buffet breakfast is served daily from 7:30 a.m. til 10:00 a.m. and they do offer room service. The charming rooms and suites offer free in-room WiFi and there is a free hotel airport shuttle. The main city entrance and passage through Cesky Krumlov begins with the castle, featuring amazing views of the seven hector (nearly eighteen acres) property, and leads all visitors to the Church of St. Vitus and the bridge located next to the Hotel Dvorak, where a statue of Saint Martin holding a cross stands to overlook the Vitava river. From this bridge, visitors have an outstanding view of the Castle and Hotel Dvorak, with it’s charming and inviting outdoor riverside restaurant. While dining guests may relax over lunch while watching tourists kayaking along the river running through Cesky Krumlov past the Castle. 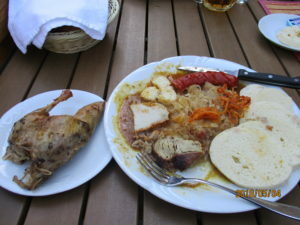 Cuisine at the hotel restaurant is authentically delicious and is overflowing with Czech favorites. Cesky Krumlov dishes have Germanic influences and in some instances a bit of Italian, but I found them to be rich and satisfying. The sauerkraut was sweetened with honey and I loved it. I found these dishes to be some of the best I’ve tasted traveling through five countries in Europe during a recent trip. Menu favorites include roast chicken steak with fresh herbs or with basil sauce, roast pork knuckle with pickled vegetables mustard and horse-radish, roast duck with old Bohemian sauerkraut and home-made dumplings, roast pork ribs on honey, divine soup with home-made breads and my favorite named Gourmet Delicacy Krumlov, a roast pork, and roast sausage with cabbage to be enjoyed with your choice of local beer or wine. 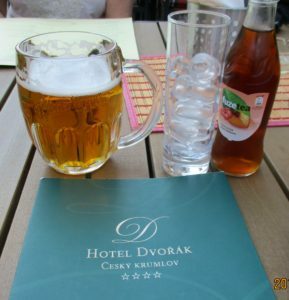 Local beer is very popular and Czech wines pair perfectly with the Dvorak lunch plates. The service is outstanding and the ambiance is pure magic. Shopping along the historic cobblestone streets is fascinating and includes everything from a pharmacy serving champagne, to an endless collection of unique gift shops filled with china, crystal, food products, art and a bevy of Cesky Krumlov souvenier items to take home. Chocolates and “certified regional” gingerbreads are sought after by visitors. Many of the cozy restaurants and tea rooms sit above the river and feature dining on their patio with Castle views. 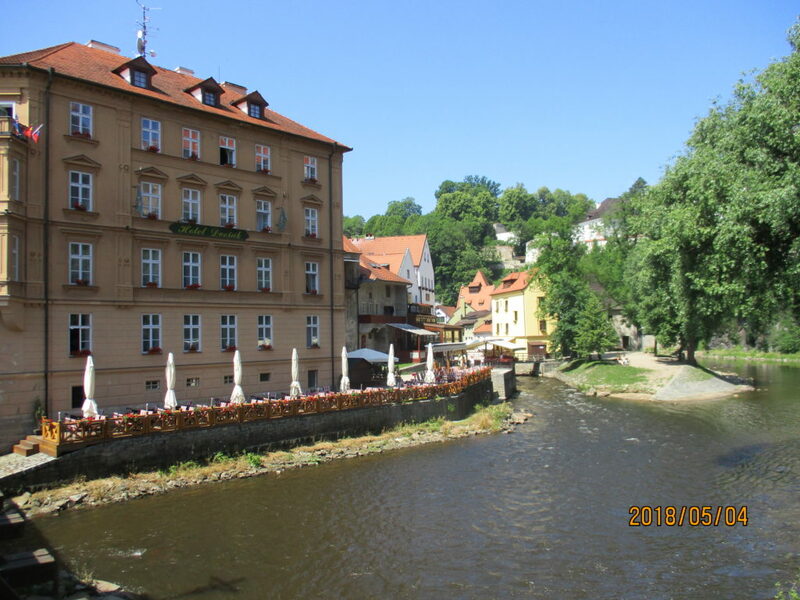 Food and beverage venues line the streets and include Czech specialty cafes, sausage houses, as well as creperies near parks with beautiful views that create gathering places for tourists to rest, take photos and enjoy the delightful musical entertainment of local musicians. For adventurers who want an especially unique view of the beautiful Bohemian city try the air ballooning rides available to tourists. The main square features small hotels with bars and a torture museum which was attracting quite a crowd. The local ice cream shop offered huge cones of colorful creams to keep everyone cool as they sat and people watched in front of the square fountain. The Czech Republic and Germany are both known for their fine beers and Budvar Beer is a favorite in Cesky Krumlov, where the Svachovka Spa offers a unique Beer Bath treatment. From October 26 through November 30 the annual wine festival features 300 wineries and begins with St. Martin riding a white horse through the streets in honor of Moravian Vineyards. For 2019 information visit www.festivalvalvinack.cz.